Gun Collector’s Daughter, 1975, Gift of the Estate of Michael C. Williams. The first painting Glenn Howarth ever made was of a Daisy rifle in a leather sling as an eight-year-old boy. His father taught him how to shoot and he became a competition-winning marksman, cadet, and shooting instructor. He received further instruction and competed with the Canadian Scottish Cadet Corp. He equated the blast of a gun with the release of anger, lending a cathartic aspect to the activity. Similarly, his painting acted as a mode of emotional processing and release. Vision is an integral component in both shooting and painting. The shooter focuses on a single object and everything in the periphery dissolves into a blurred impression of their surroundings. 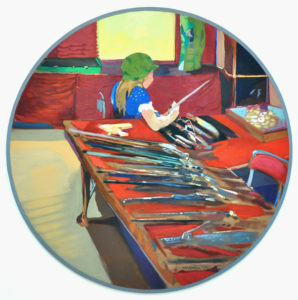 Although Howarth did not use a circular site on his rifle, a visual connection arises between that mode of sighting a target and tondo painting, perhaps lending context to the origin of the artist’s choice of circular canvases, as well as his preoccupation with the science of vision.